Who doesn't want a little bag bling? Brag about your handmade bag and show quality and style at the same time. Pair with a matching zipper pull. 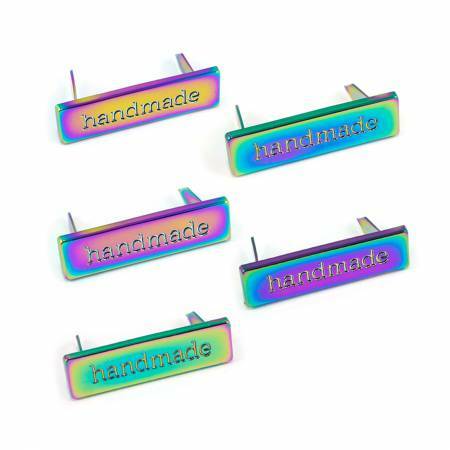 These bag labels are finished in a shiny iridescent rainbow of color. Please note: The color varies for each label and none of them are exactly alike. You may get a label that is more pink or yellow or blue, because they are all different. They do not change color but have the look of iridescence. We cannot select specific colors for you. Use in the lining or on the exterior of your bag, on the back or front of your clutch, wallet, or purse. These attach with 2 metal prongs and a washer. Simply mark and cut holes, place onto interfaced fabric exterior or lining, and fold the prongs over the back washer. Place a layer or 2 of fleece, felt, or batting over the prongs before the washer for a tighter fit. Sold in packs of 1. Meausres: 3/8in (10mm) x 1-3/8in (36mm).